Welcome to another First Kiss Friday. Today’s guest is a new author to me named Rozsa Gaston. This book looks fabulous and I’ve already grabbed my copy. We hope you enjoy this first kiss scene from Rozsa’s book, A Sense of Touch. Enjoy! THAT EVENING, THE horse nuzzled Nicole as Philippe crouched low, examining him. All traces of his sadness of a few hours earlier were gone. “You tickle me, Petard,” Nicole giggled as the horse burrowed his large muzzle under her arm. Philippe looked up, his expression hard to read. The crackling energy she felt from him at times was back. Suddenly, he no longer seemed like a youth anymore, but a full-grown man. She watched as his eyes followed where the horse’s muzzle was on her body. Philippe’s every muscle seemed alert, alive. Digging into her further, the horse’s huge head knocked her off balance; she stumbled back. Philippe’s arm shot up to steady her, hugging her around her lower back. With his other arm, he grabbed her just below the soft curve of her backside. It was a place no one’s hands had touched since Nicole had matured the spring before. The sensation of him holding her so firmly, of his eyes locking onto hers, gripped her as tightly as his arms did. No longer in danger of falling, she felt as if she were. Strange new slithering shards of energy traveled up and down her torso and legs. Petard had moved back, his head turning in the direction of a bird’s cry from behind where Philippe crouched. Returning Philippe’s gaze, she placed her hands on his shoulders. Underneath her fingers, she could feel the tautness of his muscles; even more so, the focused attention at which they stood, as if waiting to receive direction from her. She slipped down to his crouching position. His hands slithered up over either side of her torso until they rested under her arms. His thumb-tips pressed lightly into her collarbones, then more firmly. Staring at him, she sensed a boundary present, a decision underway. It was hers to make, judging by the attentiveness with which he held her. Slowly, with one hand, she covered his and pulled it out from under her arm, sliding it over her breast. What was she doing? All she knew was that she would have her moment before her father married her off to the rich older nobleman he had decided upon for her. Her time to reach for what she wanted was now, before she disappeared forever into the confines of married life; far from this youth with the gray-green gaze that moved her strangely when it fixed on her. His sharp intake of breath told her he was cognizant of the forbidden territory they now traveled. Would she allow him to wander farther? Taking her hand off his, she waited to see what he would do. Slowly, he moved his hand over her other breast then back again and, finally, sure of its terrain, it proceeded to the middle of her chest and upward to the base of her throat, against her warm, bare skin. It was as if her heart had slowed down, along with time itself. Each beat seemed deeper, more resonant. She raised her head, waiting. With fingers splayed, Philippe’s broad hand traveled up, twisting as it went to fit the line of her jawbone. There it rested, his palm cupping her chin, his index and middle fingers on her cheekbone. His thumb rested on the side of her mouth. She opened it slightly and felt his thumb journey along her lower lip and back. Her entire body quivered. “My Nicole,” he murmured back. “Am I?” For the moment, she belonged to herself, but by the following summer she would be a married woman. “I wish you were,” he answered, then moved his face toward hers until their noses touched. “And you?” he asked, almost imperceptibly. “I wish I was,” she answered, closing her eyes and letting go of every conscious thought that could come between them. There were many, but at that moment there were none. His kiss was tender at first, then firm, heady. As it deepened, his hands came around her back, pressing her to him. When she opened her eyes, she saw that his own were wild, as if starlit, with an expression in them she had never seen before. A hint of danger glinted there, yet she knew him, didn’t she? Was he not still her Philippe, the youth whose hair she washed ? Reaching for him, she pulled him to her. This time, it was her lips that sought his, opening beneath his, feeling his tongue press into her mouth, tasting and probing. Not expecting such an intrusion, she pressed her teeth gently down on his tongue, bidding him stop till she was ready to proceed again. Soon enough, she was. This time, she put her own tongue into his mouth, dancing and rolling over his. They were like two lambs frolicking in a pasture. His taste was delicious, unlike anything she had savored before—fresh, young, and virile. Perhaps hers was, too, judging by the way he breathed so deeply. His breathing sped up, and he stood, lifting her to her feet with him. She flung her arms around his neck and craned her head up, receiving his kiss in the pink and purple rays of the setting sun. Never had she felt like this before, never did she want to let go of this moment. “Nicole! Are you there? Nicole!” a voice called. Great shuddering gasps came over her, whether from awe at what had just taken place, or shock at having it end so suddenly, she knew not. “I will be right there,” she called, quickly breaking away from him and smoothing her hands over her gown. “Where are you? I don’t see you!” Marie de Volonté exclaimed. Good. Nicole looked up at Philippe and put a finger to her lips. Catching his stunned expression, she giggled. Inside, her heart stirred, not her loins. But now, for the first time, she knew what it was to have her loins stir, too. She had never known before. It was a powerful sensation, as if an ancient call from the wild was pulling and straining at her, rendering her reason senseless, her senses as tight as the string of a well-tuned lute. Putting her hands up to her hair, she smoothed it over her shoulder, checking with her fingers that no telltale hay or grass was caught in its long locks. Satisfied, she smiled at Philippe. “Tomorrow morning. Take care of my stallion,” she bade him. “Take care of my heart, and bring it back tomorrow,” he replied. Her own heart leaping for joy, she turned and ran toward Marie de Volonté, still searching for her on the far side of the paddock. “Here I am!” she sang out, finally ready to be discovered. As she caught up to the young noblewoman, she prayed Philippe had hidden himself. “Happy to be working with Petard again?” Marie asked. Her face was impish. “He’s better today. My poultice is working its magic,” Nicole told her. “Something is working its magic,” Marie replied, studying her closely. She reached over and plucked a stray piece of straw from Nicole’s hair. Nicole looked at her guiltily then caught herself. “How did you know I was here?” she asked sharply. “Oh, you mean Dom.” Relief flooded her. She would use what she knew about Marie and him to keep her quiet. “No, not him,” Marie answered. “Then who?” Alarm rose in Nicole’s stomach. “The one over there.” The younger girl pointed toward the barn. “No one’s over there,” Nicole said, straining to see in the gloaming. Marie looked in the direction Nicole did. “Oh. Well, he was there a minute ago. I asked him, and he pointed over there,” Marie indicated where Nicole and Philippe had just been. “Do you know who it was?” Nicole asked, hoping it hadn’t been Philippe that Cook had meant. Besides Dom, there was another young stable-hand who mucked out the horses’ stalls. Had he seen them? If so, how much had he seen? Her heart thumped wildly at the thought. He was said to be slow-witted, but that didn’t mean he was mute. No one was at court. “What did you see?” Nicole’s heart thumped. “Nothing, my lady. Your eyes are as full of magic as your healing hands,” Marie answered blithely as she sauntered up the path. “What does that mean, pray tell?” Nicole demanded. Unused to being on the defensive, she didn’t like it. She would switch positions as soon as she found a way. “Lucky the one they touch, that is all,” Marie replied mysteriously. “I will not say,” the younger girl giggled, then put her finger to her lips in an identical manner to the way Nicole had just done with Philippe. There was nothing more Nicole could do than swallow the next thing she wished to say. It wouldn’t do her any good to blurt it out; it would just incriminate her further. Biting her tongue, she joined Marie in laughter, praying that the younger girl would keep a secret. Besides, Nicole felt like laughing too. Her heart danced for joy at the memory of Philippe’s touch. In July of 1497 Anne of Brittany, Queen of France, gives birth to a son. Within hours the child joins the five dead siblings who came before him. In the mournful weeks that follow, fifteen-year-old Nicole St. Sylvain meets Philippe de Bois, a young horse trainer breaking in one of the queen’s stallions. The attraction between the two is immediate, but duty and honor bring their romance to an abrupt halt. They work together to heal the horse’s infected hoof, then part ways. As the daughter of a wealthy but untitled merchant, Nicole exists in a precarious social position. Her family has money, she is the sole heir, but she is only noble on her dead mother’s side. An arranged marriage to an established noble family will secure her future but dash any hope she has of a life with Philippe. When the queen’s only living child falls ill, she remembers Nicole’s skill as a healer. If Nicole’s healing sense of touch can save the royal child, will the queen reward her with the greatest desire of her heart—marriage to her one true love? Rozsa Gaston writes about men and women who follow their hearts as well as their bliss. Her motto? Stay playful. She studied European history at Yale, and received her master’s degree in international affairs from Columbia. In between she worked as a singer/pianist all over the world. She lives in Bronxville, NY with her family. Gaston is currently working on Anne and Charles, sequel to Sense of Touch, a fictional account of the life of Anne of Brittany, Queen of France, with first husband Charles VIII of France, during the years 1488-1498. 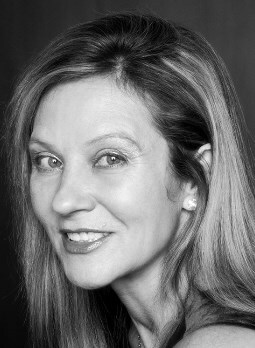 Her other works include Dog Sitters, Budapest Romance, Running from Love, Paris Adieu, and Black is Not a Color. Post an online review of Sense of Touch and she will thank you with a complimentary e-book edition of your choice of any of her other books at http://bit.ly/RozsaGastonbooks. Find her on Facebook at https://www.facebook.com/rozsagastonauthor. 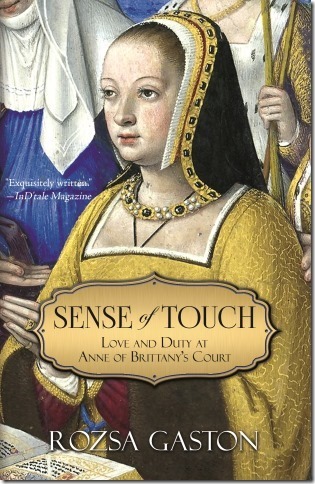 An entertaining and well-written story on Anne of Brittany. Enjoyed the female characters, Nicole and the queen, who went after what they wanted and got it. Gave the book to my daughter to read. Great role models for girls in this story. Thank you for stopping by Bill. I have this in my TBR pile. Can’t wait to read it!